Johanna Calle, “Minusculas,” 2013. Typed text on Japanese paper and acrylic. 33 x 145 x 34 cm (12 pieces). In her third solo show at Marília Razuk Gallery, Colombian artist Johanna Calle features three new series, named Minùsculas, Párrafos and Simbiontes. As in other series from the artist, graphic and visual productions are conjugated along with raw materials like wire, iron and steel. 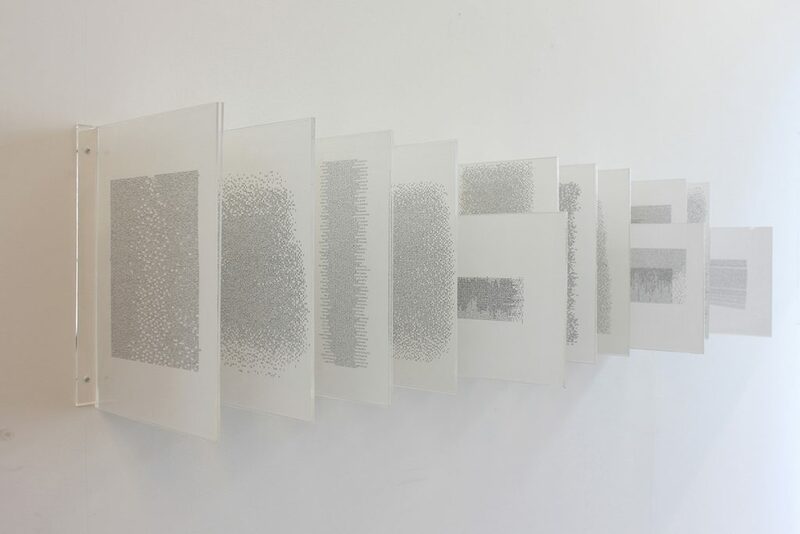 In addition to these, Calle employs craft techniques like sewing and drilling, handwritten and typed texts, as she searches to produce subtle and meaningful images, which frequently evoke vulnerability, fragility, precariousness, resistance and infringement. These new series on show make references to the impositions and actions of reading (Minùsculas), questions regarding the visual nature of letters and linguistic structures (Párrafos) or referring to symbiotic relationships between organisms performing together for mutual benefit, despite being different (Simbiontes). Spanish (Calle’s native language) is employed as raw material together with other alphabets as well, in actions that challenge the communication possibilities of each code and, at the same time, question the inherent violence and abstraction beholden in the clash of languages (and so, of cultures) that formed all the former Latin American colonies. Nevertheless, all the intellectual and historical meanings are not freely given in her visual compositions: they are never easy, nor quickly perceived. They provoke the spectator to perceive many levels of each image, to unfold an intricate universe of known and new signs. Johanna Calle, “Parrafos,” 2012. 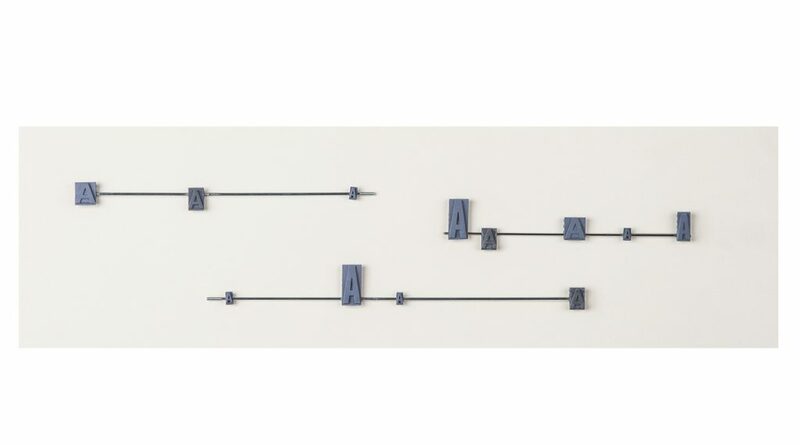 Steel and rubber letters on paper 32 x 66 x 7 cm. Her works have different forms of writing as starting points, such as manuscripts, letters, musical scores, even mathematical formulas. Her fusion of drawing, visual constructions and language establish a practice which is often described as delicate and forceful. But if we think these might remain as mere abstract and visual productions, we might miss another level of Calle’s work: one that conjugates lines, words and signs to also evoke the many disparities that permeate the Latin American society, where narratives gains a different pace and known images are imbued with a new weight.